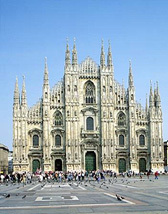 I have just come back from Milan, and I had a brilliant time there! There is so much to see and do, and it’s not all about the shopping (although that is excellent too!). I have been to Milan a couple of times now, and it is a city that I would love to continue visiting. I have no hesitation in recommending Milan as an excellent location in which to learn Italian, as for someone that is interested in Italian culture, history, art, music and shopping (like me), Milan is perfect! It is also an excellent location from which to visit other exciting locations in Northern Italy, such as the lakes, Turin, Verona and Genoa! The first evening I arrived, I took a gentle stroll down to the Piazza del Duomo, which is in the heart of the city and very close to the school. In the evening light, the Duomo looked positively magical, glowing a bright ivory in the setting sun. Perched on the steps of the Duomo, I ate my gelato (the most delicious ice cream I have ever tasted!) and watched the Milanese heading through the piazza, on their way to aperitivo, and then dinner. I LOVE Milan!! Like most girls, I really like shopping – Milano is the capital of fashion and really one of the best places in the WORLD for shopping!! You should really come during the sales, if you can, you will be truly amazed at the bargains you can get! I NEEDED a new bag, a pair of jeans, possibly a pair of shoes and a coat. During a lunch break I went to a very good shop near the school called Renna Sport. They sell all the best brands and they were all 50% off. Well, I couldn’t find what I was looking for, but I came out with two Armani jumpers and a belt … not bad for the first attempt! The next day I tried La Rinascente to look for the bag and the jeans. 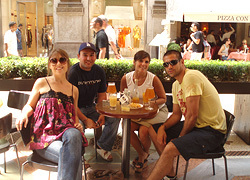 Life in Milan never stops! One of my favourite things in Milan is the nightlife! Usually it starts at 20.00 with the typical Happy Hour. In every bar and pub of the city the lunch counter is full of every kind of delecacy, from appetizers, to pasta, and Italian cheese. The Iguana Cafe is the happy hour par excellence! After the aperitif, all the people meet in the various restaurants of the Navigli and the centre, to taste every kind of food, not only Italian, but Brazilian, Mexican, Spanish, Chinese, Taiwanese… To keep on with the evening, everybody moves on to the most trendy discos of the area, where music and fun are guaranteed! The Holliwood, in Corso Como, is the traditional disco in Milan, where celebrities, tourists and students meet. Then there is the Just Cavalli cafe, a pub created by the eccentric Tuscany fashion designer Roberto Cavalli, located in the Parco Sempione area. Here all the smart and classy people from Milan get together. Fashion & Design in Milan…what a great course! Ciao! 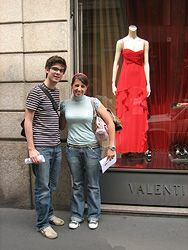 I’m Andrea from Colombia and I attended the Italian for Fashion & Design course at the school in Milan. I had such a great time that I now want to stay here!! I have to say that this particular course has been really interesting. The course focuses on learning the vocabulary of fashion and design, but at the same time you do different activities. For example, one afternoon we worked on a project for a hotel. We had to do it with help of magazines pictures and then do a collage. Afterwards we had to present our ideas – in Italian of course!